The Travel Safe is designed to keep your valuables safe from theft. It only takes a few seconds for a thief to steal your cell phone, iPod, jewelry, watch, passport or whatever you want safe. Whether it's a business trip or just a trip to the beach, for your locker or at school, the Travel Safe provides convenient security and the protection you need. The sleek PolyCarbon strengthened ABS case provides an elegant appearance with it's lightly texturized surface. The resettable four digit combination lock with vinyl coated steel security cable enables you to secure the safe to a multitude of objects. A luxurious lining pampers your valuables while providing the protection you need. We also include a pouch for your jewelry, watch or other important items. The Travel Safe applications are limitless. It's a necessity at the beach or pool. Just place your cell phone, ipod, watch, jewelry, money, camera, etc. 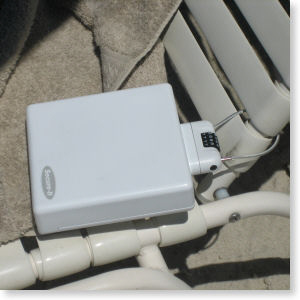 in the Travel Safe, lock it to your lounge chair or table and protect your valuables from theft, loss or damaging sand. Great for Mobile Executives who spend time in hotels or conference centers or for students on campus. Secure items in your car instead of leaving them visible and vulnerable. A perfect solution for athletes going to the gym or on travel teams. They will find it great for securing items to their travel bag or locker. 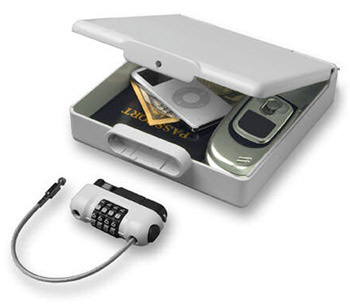 This portable and convenient security safe is a perfect gift for anyone! Your valuables have never been more secure!